Next week we will again erect the Memorial to the Lost in the church yard. Some describe it as a t-shirt graveyard, and it feels that way. 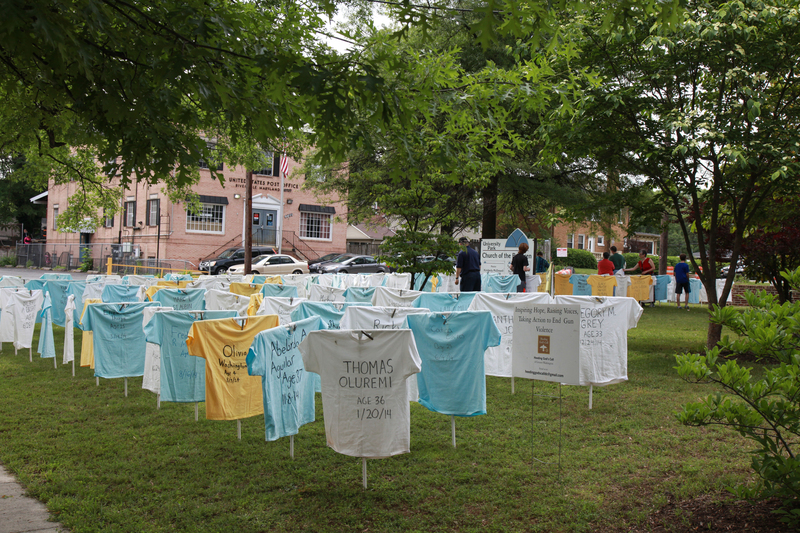 Each shirt marks one of the 205 lives lost in our region during 2016 to gun violence. They were young and old — from Maryland and DC and northern Virginia- every loss a sudden end to life given by God. The plague is violence in our culture.And the plague is the use of guns to kill other human beings. This is the third year we have partnered with Hyattsville Mennonite Church to host the Heeding God’s Call Memorial. Days after we put it up in 2015, Dylann Roof shot and killed nine people at a Bible study in Charleston. Shortly after we erected the Memorial in 2016, Omar Mateen shot and killed 49 people at the Pulse nightclub in Orlando. And this week in 2017, we grieve yet another mass shooting, as the entire country laments the senseless deaths in Las Vegas. So we will erect the Memorial and will remember and pray and pledge ourselves to making change…again. Because we believe that there is another way of living. Because we think that there are connections to be made between reliance on guns in private and in national and international arenas. Because we have known a reality in Christ that reminds us of the value of every person. Because there are sensible gun regulations for which we must advocate that will protect life . Because symbolic action leads us toward hope! Last year, 155 people in our metropolitan area died of gun violence: There were two children who were three years old, a 73-year old man whose life was irrevocably altered many years ago when he was shot, dozens of teens and young adults, and many in the prime years of their lives. Some died by their own hands, some at the hands of others. 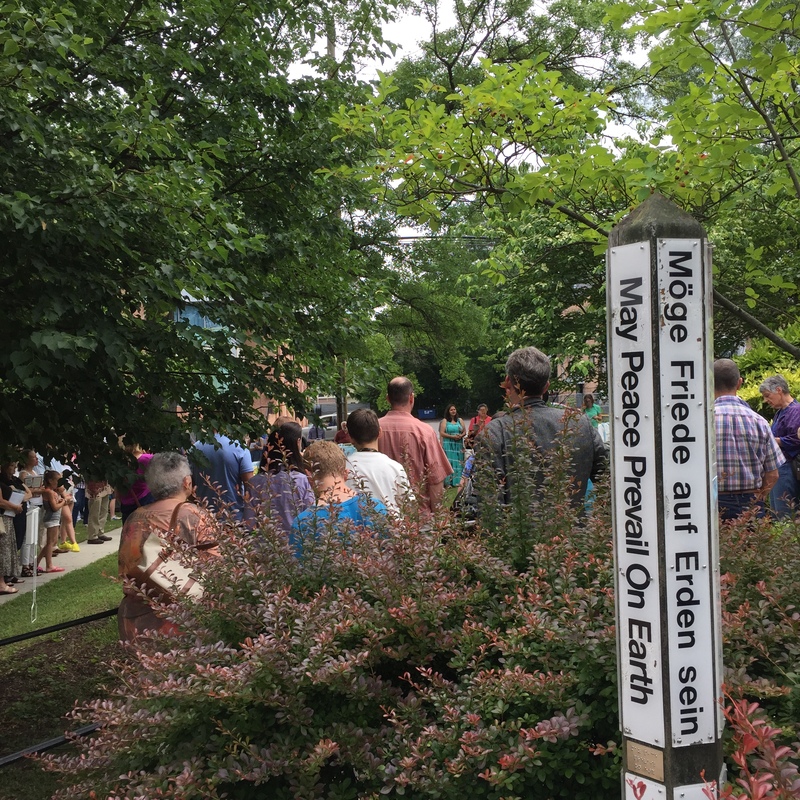 We at University Park Church of the Brethren and at Hyattsville Mennonite Church stand with the faith-based efforts of “Heeding God’s Call” –lamenting this loss of life, grieving with those left behind, and calling for change to prevent such tragedies in the future. We acknowledge that none of us is immune to fierce impulses within or beyond us. But behind the trigger stand arrayed forces of cultural violence. Recognizing that economic interests, fear, militarism, poverty, and racism are at play, we want not only to mourn the tragedy of gun violence, but to transform it. The One who calls us to seek the welfare of the city in which we live is here among us. In this place and beyond, many are working to address causes of the crisis. They tend to the vulnerable. They advocate for just regulation and accountability. They invite us to join in stepping forward to act. Today, we light the peace lamp as a sign of our commitment to be a part of this diverse community of concern and deeds. Let its flame burn steadily. A flame of love for our enemies. Our anxieties are too much and our trust is too little. Falling captive to fear, we build defenses. All: Turn us and transform us. One: Removed from violent death, we are often oblivious. Privileged enough to turn away, we close our eyes. One: Busy with our lives, we are distracted. Ill at ease with confrontation, we remain silent. 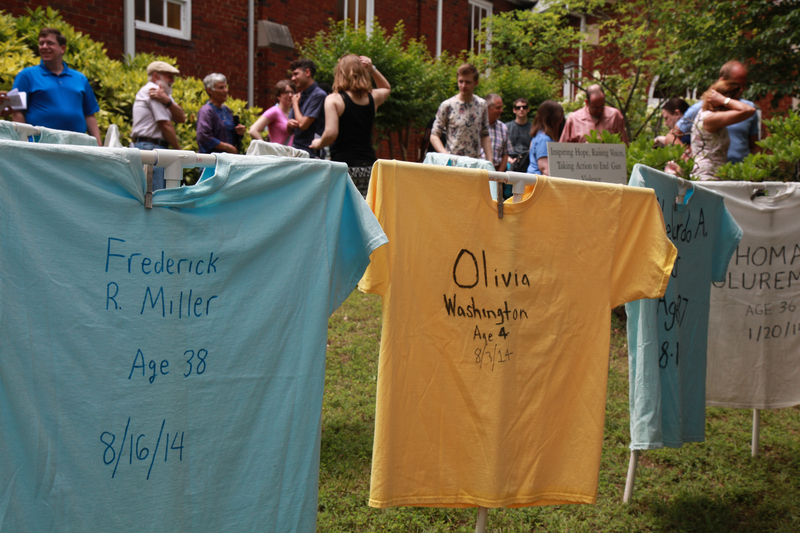 Behind each of these shirts is not only the person it represents, but the parents, siblings, extended family, friends and neighbors who know the grief of loss. And behind each is a hand that pulled a trigger for reasons that can, we believe, be avoided. Behind them is a community broken by this violence, longing for healing. And in the midst and beyond all of these is the God who yearns for the wholeness of our community and every community on earth. We’ve heard the names. 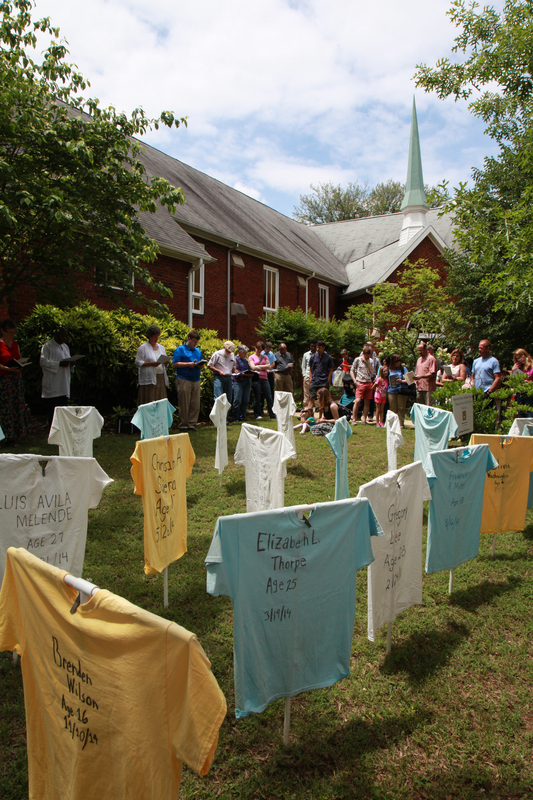 We see these shirts that remind us of their living, breathing presence in the world. And we protest their loss. Follow the link to see the 2015 Memorial list of 155 names (1) that each shirt is labeled with. 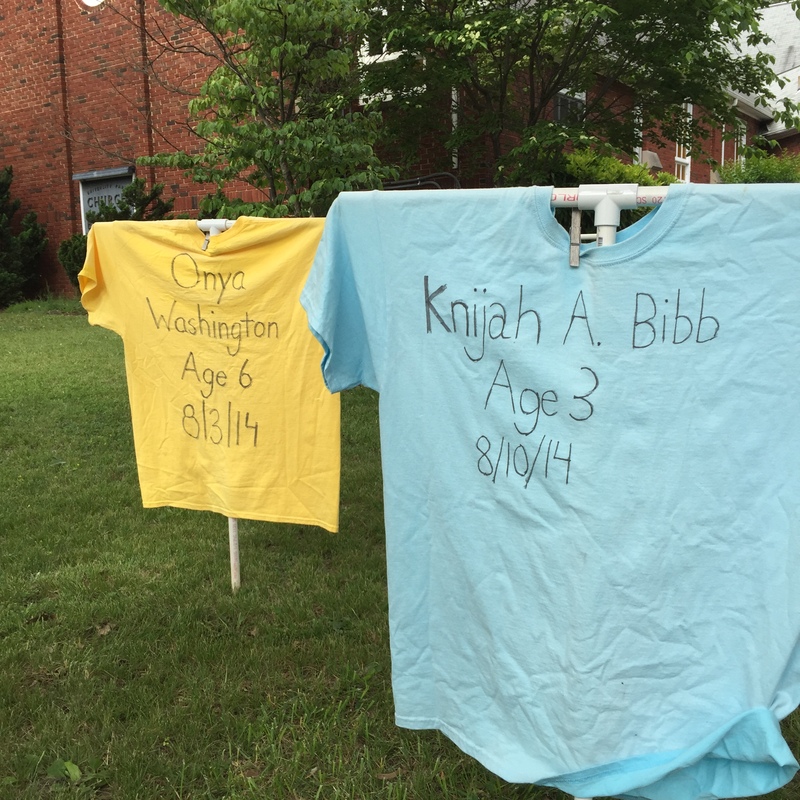 All were a child of God that was killed by gun violence in 2014 in the Metropolitan DC area. This post includes excerpts from the service around the setting up of the memorial at the University Park Church of the Brethren. This week UPCOB will be joining in a postcard campaign sponsored by Heeding God’s Call. 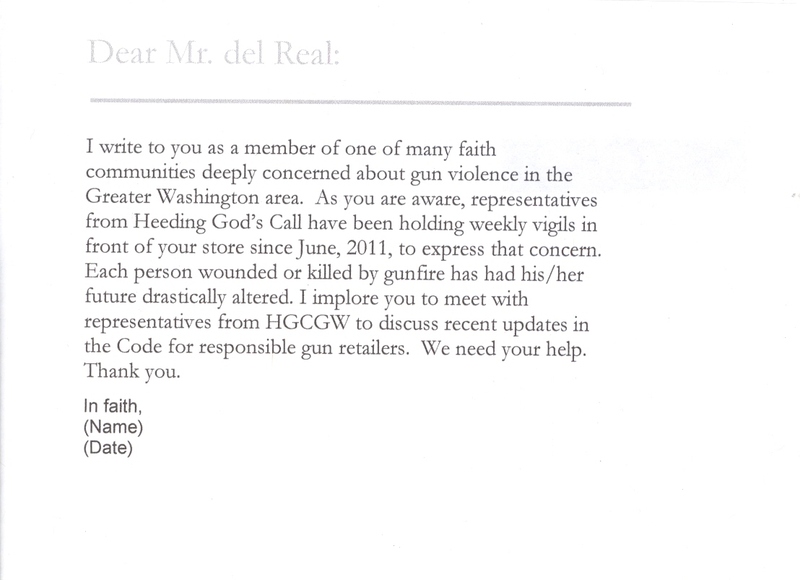 It encourages the owner of Realco Guns (located in District Heights) to sign a voluntary code of conduct which would help to limit the ways lethal weapons can fall into violent hands. Realco is ranked as one of the top gun stores in the U.S. associated with weapons used in crimes. The code of conduct has been signed by the nation’s largest gun dealer (Wal-Mart Will Send Representatives to White House), and by Mayors Against Illegal Guns. We will be distributing, signing and collecting the postcards on Sunday, March 3 during our worship service. If you won’t be at church please feel free to print the postcard above, sign it and send it to the church office.